Hello everyone, I’m Todd Williams, it’s April 22, 2016 and today I’m embarking on what I hope will be an interesting and informative series of podcasts about the life of my father, Ray Hintze. My son-in-law Weston’s foray into podcasting is what inspired me. A few months ago he started podcasting relatively short interviews with each of his parents and siblings, mainly to share life experiences and personal insight with his extended family, and I admit I caught the bug. So, a few weeks ago I mentioned to my dad that I wanted to interview him when he came to Texas for my daughter, Katelyn’s, wedding in early April; and he agreed to the interview. To prepare myself and him for the interview I re-read his written personal history, the one that he and mom collaborated on back in 2001 thru 2003, and I sent him a series of questions for him to think about in advance. Now, dad has had a long life. He was born in 1931 and turns 85 in July of this year. When I got to the point in his history when he married my mother in 1969 (which was his 3rd marriage, by the way), I had five pages of questions and time was running short (and we were pretty busy preparing for the wedding guests that would be descending upon us in just days). So I sent him those pages of questions and figured that I’d just see where that got us. As it turned out, we only had enough free time during the week he was here in Houston to capture about 3-1/2 hours of recorded interview, and we had only covered the five pages of questions up through 1969. I fully expect to be able to complete the interview in the coming weeks as our schedules allow; even if it happens over the phone, or Skype, or Facetime, or whatever. Now, I’m not going to make you listen to the raw 3-1/2 hours of our interview. What I am going to do is break our interview down into segments that will range from about 30 to 60 minutes in length. I will publish those podcasts weekly over the course of a few weeks. Interspersed throughout the interview I intend on adding my own commentary on some of the things I learned about some of the topics we discussed. For example, in the interview, dad mentions the Elberta peach, which I believe he alludes received its name from the town of Elberta, where he was born and lived until he was about 5 years old. As it turns out, there were peach orchards in Elberta, but the town was actually named after the peach, and not the other way around. I researched that topic a bit and interject some commentary about that in the interview, because I thought it was interesting. As far as I can discern, dad’s memory is as sharp as ever. I asked him to delve back in time 60, 70, and 80+ years during this interview and, for the most part, his ability to recall events and names from so long ago was remarkable. So, this series of podcasts will hopefully be entertaining and informative, and give you some insight into the life of a man that many, many people call husband, father, grandpa, great-grandpa, uncle, friend, associate, and so on. I have one final comment. I’m not a professional interviewer nor podcaster. I’m actually an engineer, and by nature engineers are boring and drab. I’m doing this on my home computer by myself using Apple’s GarageBand software. Sometimes the audio and production quality isn’t perfect, and I make mistakes in the interview process. When you hear these imperfections, please be kind. It’s a lot harder than you think. If you have comments about any of the content of the interview, please contact me and share it with me. I’d love to hear your insights and thoughts. With that said, I hope you enjoy this series of podcasts. 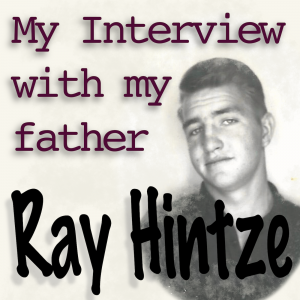 And now, my interview with my father, Ray Hintze.